This is a packet of 32 American Greetings Justice League stickers released in 2017. There are two sheets and each eye-catching sticker is molded in 3-D. There are numerous heroes represented here by their logos: Superman, Batman, Wonder Woman, Aquaman, Green Lantern, The Flash, and Batgirl. 1 week ago April 15, 2019 in NOVELTY. Here’s another collectible about the 1970s/1980s Super Friends cartoon series. This is another version of the Super Friends Superman pencil sharpener produced in 1980. It’s exactly like the one I posted previously, except the design is of Superman running against a yellow background toward us. As it was with the other sharpener, the art is also by the legendary artist Neal Adams. February 22, 2019 in HOUSEHOLD / OFFICE / SCHOOL. As part of the merchandising for the officially licensed DC Comics Super Heroes Stamps, the United States Postal Service produced this “First Day of Issue July 20, 2006” mug. the mug features an array of their superhero stamps as a partial opacity background and features three of their prominent stamps: Batman, Wonder Woman, and Superman. February 21, 2019 in PLATES, DINNERWARE, ETC.. Here is a fun Justice League movie plate distributed by Zak Designs, Inc. Produced in 2017, it features images of Batman (Ben Affleck), Wonder Woman (Gal Gadot), Superman (Henry Cavill), Cyborg (Ray Fisher), Aquaman (Jason Momoa), and The Flash (Ezra Miller). January 10, 2019 in HOUSEHOLD / OFFICE / SCHOOL. Offered exclusively in 2018 at Wal-Mart stores are these Justice League of America and Superman 100-Page Comic Giant comic books. With a nod to the classic 100-page comics of the 1970s, both covers are vibrant and eye-catching. Both comics are packed with stories, some new and some reprinted, that is sure to get both old and newcomers to DC Comics characters excited. August 21, 2018 in COMICS / GRAPHIC NOVELS. ﻿Hello everyone! 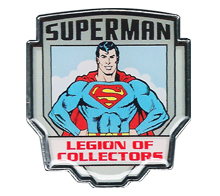 I’ve been away from this blog for a while and now I’m diving right back in with a brand new Superman related collectible that can be found in stores now! This is a box of Honey Maid Justice League Graham Snacks. Produced by Nabisco, these disc shaped graham crackers are “embossed” with the logos of various heroes from DC Comics: Superman, Batman, Wonder Woman, Cyborg, Aquaman, and The Flash. August 15, 2018 in FOOD / BEVERAGE.